Heat oven to 350 degrees. Spray 2 quart glass baking dish with nonstick cooking spray. In large bowl combine all ingredients; mix well. Spread into prepared baking dish. 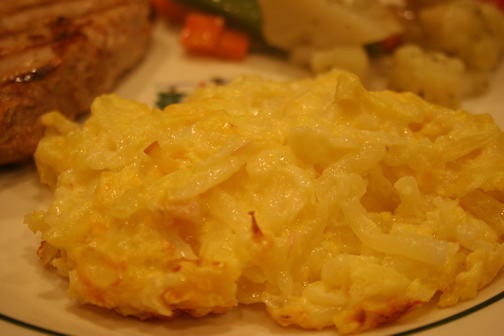 Bake 45 minutes or until hash browns are tender. How long would I cook the cheesy hash browns in a crock pot? I honestly don't know. I've never tried it. You might start with 3 hours and see how it goes.